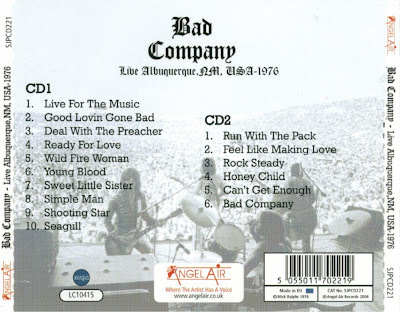 This first-ever Seventies live album from Bad Company is a two-disc set recorded on 3 Oct 1976 in Albuquerque NM on the band's Burnin’ Through America tour. The set comes with a 20 page booklet full of photos from Mick's own archives, as well as liner notes by Keith Smith. 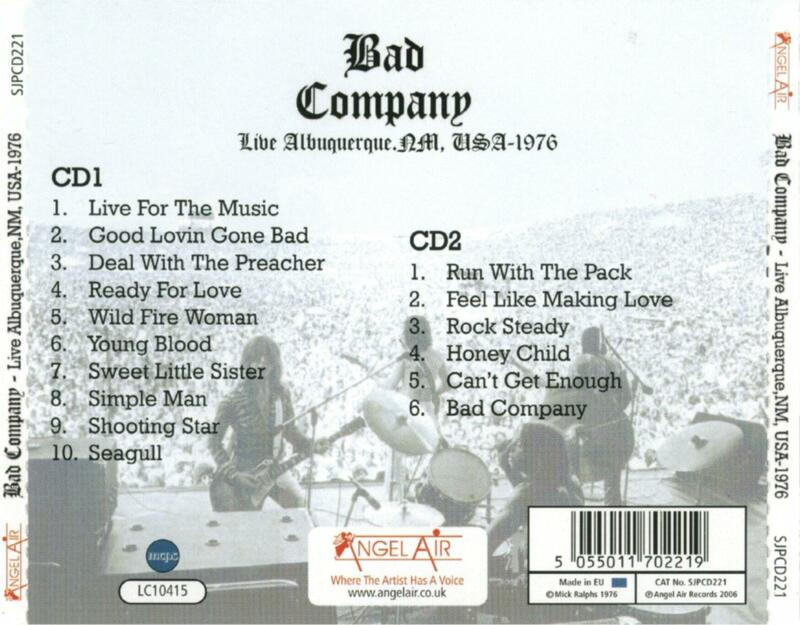 A live Bad Company CD was due from Angel Air in the summer of 2006. 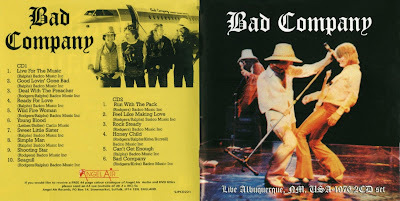 Live In Albuquerque 1976 (UK Angel Air SJPCD 221), as the name suggests, is a two-disc set recorded during the band's 1976 Burnin’ Through America tour. It is the first-ever live Bad Company album to capture the group at the peak of their powers in the Seventies. Unfortunately, the album was withdrawn just before release, and the few promotional copies that slipped out now command top dollar in collector circles. Live in Albuquerque, 1976. This is an officially made CD that was deleted before it was released in 2006. It is very unlikely that it will ever be released now. A very small amount of copies slipped out and are in the hands of collectors. Ex SBD stereo. 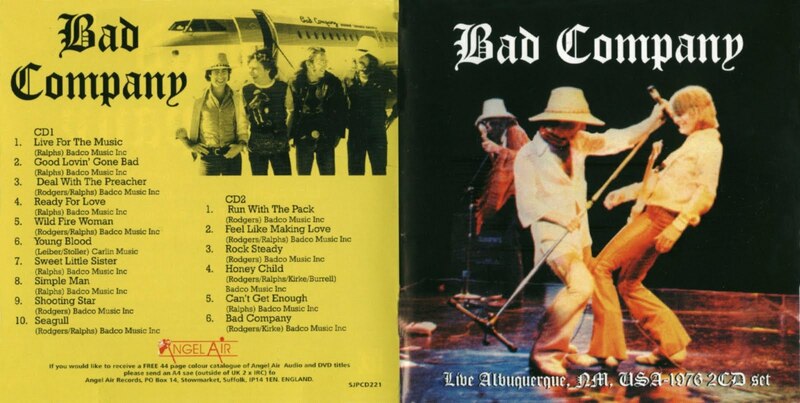 Most Bad Company Fans have been waiting 30 years for a live album from the original band line up, so when the reunion tour happened in 1999 and Mick Ralphs in an interview stated that he was going to sort through his private tape collection with the intention of releasing a full live show on CD, fans had something to get excited about at last. It took another five years coming then just as it was about to be released, it was deleted, due to a contractual dispute from other members of the band I've been told, claiming they did not give their permission for the release. generally regarded by most fans as the best and that's exactly what you get here. The best of the first three albums, Live! It's to be hoped that this album can be released sometime because every fan deserves to hear it, but unfortunately this is unlikely. It's also a shame the band just like many other bands could not put the fans first for once, instead of their petty squabbles. This is possible as there are so many fakes around, some have added extra bonus tracks and one I know of has even added an extra disc of Paul Rodgers live material making a 3 CD Set. There are so many fakes and so few originals around that the version in the database may be a fake. This one is definitely a genuine original silver pressing, it cost me a fortune at the time. I’ve run this by the staff who say it’s OK to post.